That search led me to this book called "Cultivate" by Laura Casey. In the book she compares gardening to life, and more specifically to how God works in her life. It has some thought provoking questions in it. This isn't one of them, but for whatever reason this is the question that kept distracting me as I read this book. What did I want to do before I die? I have this vague sense of things and events that I think will happen or hope will happen, but is there anything that I work toward making sure will happen? I've been thinking a lot about priorities lately. How do I want to spend my time? How do I need to spend my time to get the most out of this one life that I have been gifted (that statistically is half over)? How do you set priorities though if you can't decide what you want? So, maybe I should start with the end in mind. 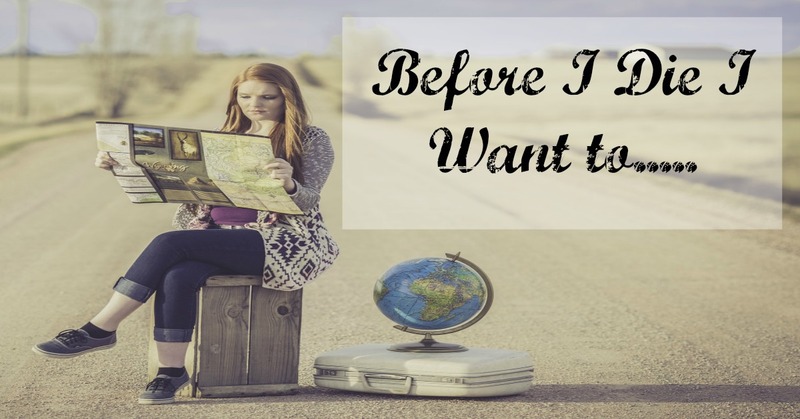 What do I want to do before I die? I stared at a blank sheet of paper for a long time before anything came to mind. Not because I couldn't think of anything, rather it was because a whole tidal wave of things came forward, enough to drown in. I wanted to hold grandchildren, and see my children happy, travel to hundreds of places, read more, make a difference in this world on a huge scale by ending world hunger, illiteracy, saving all the children and all the homeless pets - oh, and the polar bears, too. I also wanted to change someone's life with a random act of kindness or with the right words at the right time. I want to spend as much time as possible with loved ones while they are here. In short, I want to die with no regrets. That's a lot of pressure, to live a life of no regrets. How will you really know what you will regret when your time comes? In my 20's I would have regretted not moving up in my career, so I worked and moved a lot. I didn't think about travel and lasting relationships because friends are easy to make in your 20's, and you have all the time in the world and little responsibility. My 30's were a blur because I had two very small children just shy of 2 years apart. I didn't have the time or the mental capacity to think about what I wanted out of life other than keep these two tiny humans alive while continuing to move ahead in my career all while keeping my sanity on very little sleep. Now in my 40's I realize I don't have the time to not think about it anymore. I am also not the same person that I was in my 20's and 30's. This old lady wants different things because she realizes that time is not unlimited, and I don't have all the time in the world to accomplish all the things that I once naively thought I could. So what is it that I do want to accomplish? I once thought I would go back to work and continue to move up the corporate ladder once my kids were "old enough". This is not something that is in the least bit appealing to me now. What I do miss is helping people achieve their goals. Helping them go from feeling helpless to learning how they can help themselves. Showing someone that they are not a victim of circumstance, and that they have far more control of their life than they may now believe if they only have the courage to grab that control. I want to help them find that courage. I do not need to go back to a corporate office to do this. I do not need to wait until my kids are "old enough". I can look for opportunities right now to do this. 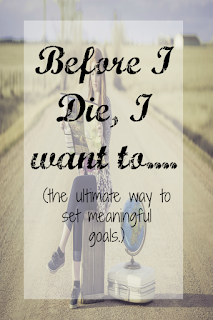 So before I die, I want to know that I continued to encourage, support, and help others achieve their goals. I want to see some places in this world that I haven't been to yet. I really want to see African animals in the wild. When I was around 11 years old, I read this book called "Cry of the Kalahari" written by this couple that lived in the savanna's of Africa practically in the middle of a lion herd. I've been enthralled ever since with the beauty of African wildlife. While I don't want to live in a tent struggling for water and such, I do want to go on a safari to see these animals in their natural habitat. Yet, I've done nothing to research how to make this happen. So before I die, I want to go on a safari. I can start this year by doing a little research in what types of safaris there are. How much do I need to save. How long do I go for? When and where is the best place to go. The perfect time is unlikely to present itself, so I need to start planning, so I can make this happen. There are a few other places I would like to go with my children. Places that are more within my reach than the safari, yet I have just kept pushing those ideas aside and saying "maybe later, now isn't a good time". It's never a good time until you realize that you are running out of time. Which leads me to the biggest item on my list. I want to do all those things I said I really wanted to do and I will get started on making those dreams a reality in the next decade or so. However, just in case I am not guaranteed those 20 to 30 + years, When I die, I want to know that I recognized and appreciated and savored the little moments with the people that I loved. I didn't waste time with my mind on something else (urgent, but not important) when what was most important was right in front of me. Not making time to keep in touch with friends is one of the biggest regrets of the dying (at any age), so guard against being "too busy" for to appreciate the memories you make with loved ones that make time stand still and live forever. 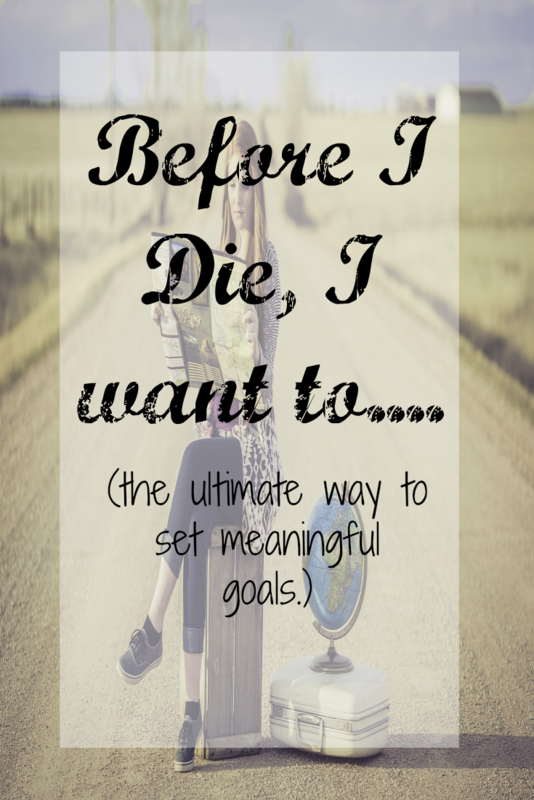 Thinking in terms of "before I die I want to... " really gets to the heart of what is most important to you. If you are still having trouble deciding how to spend your energy, ask yourself, "Will this matter in a year? 5 years?" Most stuff probably won't stand up to that test. Don't be afraid to change either. What is most important can and will change from one year (or decade) to the next. That is how it should be because you are changing and adapting from one year to the next. Working on what you want to achieve before you die in the current stage of your life is your best bet in achieving a life with as few regrets as possible. Wasting your time on things that don't really matter is the surest way to die with a whole host of regrets in any stage of life. So ask yourself right now, what do you want to achieve before you die, and what baby step will you take this week to get you closer to making the dream a reality? Better yet, share it with someone or find a buddy to be a goal getter with to make yourself more accountable to your goal, and more likely to achieve it.